Oscar, Sharks and Monster Trucks – Oh My! If you are a parent of a toddler, you know how they love to collect. It isn’t enough to have a few monster trucks, they must have at least 100 and even that isn’t enough if you are walking through the store and they see another one. They must have that one too. Soon your house which you swore would never be cluttered with toys is overrun with monster trucks! “How did this happen?” you ask yourself. The answer is simple. Your child is 3 and you can’t say No. HA! Dylan came to the studio for his 3 year portrait session and during the consultation his mom and I discussed what he loved and collected. Dylan was obsessed with sharks and monster trucks. Awesome … this is right up my alley! 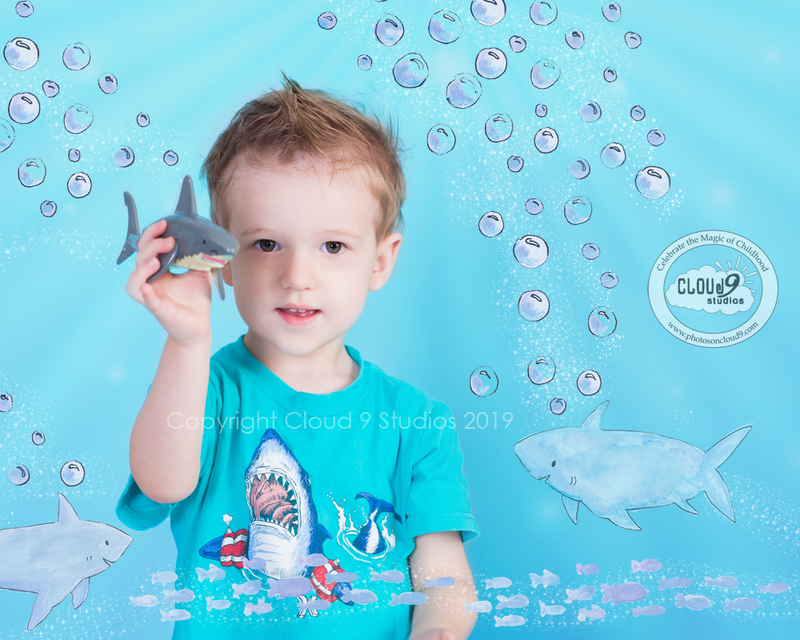 I told her to bring in a few of his favorite sharks as well as a t-shirt and I had an idea to paint him like he was underwater playing with this sharks. For his monster trucks I suggested bringing them ALL! I love to surround kids with their collections. This is so much a part of who they are at this age and I want to celebrate that and provide a forever memory for the parents to have! While talking a bit further I discovered that his mom loved Sesame Street and had a collection of characters and even a street sign with his name on it. Knowing Dylan could easily last through all three scenarios, I told the mom to bring along her collection of Sesame Street and we could do something fun with that too! A Note from Dylan’s Mom! “I love a good theme and Jeanine knows this, so when it rolled around to Dylan’s 3rd birthday I had to think up some new fun ideas that really captured him at this age. We have done pirate for Dylan for his baby plan and his second birthday so I wanted to carry on that ‘water element’ but not necessarily dress him up as a pirate again…we were giving him a shark birthday party and I was discussing it with Jeanine and she came up with this fun idea of the painting of the sharks. I love the artistic part of this shoot as well as the personal meaning. His 3rd year portrait is as one of a kind as he is! Dylan is really into the Sesame Street characters right now as I was at his age. Since he is getting older I know this phase won’t last forever so I thought this could be a cool thing to do. For Christmas he got a “Dylan Street” sign for his Cars themed bedroom so I thought it would be a cool play on Sesame Street. Jeanine and I brainstormed of how to best capture this idea and a trip to the local hardware store for a giant trashcan and the theme was complete! If you are interested in booking a session for your 3 year old to celebrate all that he or she is obsessed with right now, give us a call at 813-994-4552 or fill out this form and we will contact you!